← Extreme Makeover – Seminarian Division! When the bus pulled away, local residents Shawna and Steve Farina and family got the first look at their brand-new home – built in 96 hours and with hundreds of volunteers. Work began right after the Farinas were surprised with a visit from the “Extreme Makeover” crew and then whisked away to Disney World. During construction, a five-day Relay For Life was held at Saint Meinrad Archabbey to raise funds for the American Cancer Society – a charity close to the heart of Shawna, who is battling cancer. The show airs on Sunday nights on ABC, and the St. Meinrad episode is expected to be aired on November 12, 2006. This is a confirmed date from one of the producers as of October 10, 2006. 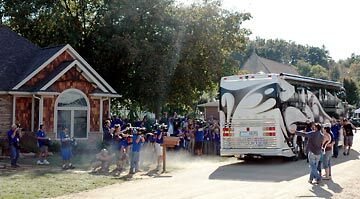 Photo: As the bus drives away, Ty Pennington, far right, points to the new home built for the Farina family. Click here to view another slide show of pictures. Click here to view slides on the construction company’s website. John-whgat an awesome service! I’ll be tuning in on November 12th and I hope to see you!